It's already September, but we've been having a series of hot days since late August. The good news is that under such intense sunlight in LA, I can do quick sun-dry vegetables and mushrooms. Zucchini is one of the items I like to sun-dry. 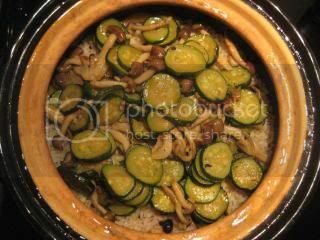 Here's another easy donabe recipe, I posted, with sun-dry zucchini. I made mixed rice with sun-dried zucchini and shimeji mushrooms. It's simple to make and so rich in flavors. 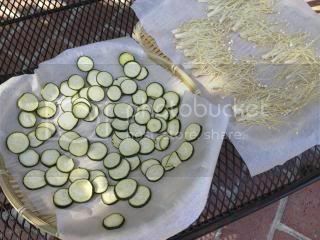 Zucchini and shimeji were sun-dried just half day on a very sunny day. They turn so rich in umami flavors and the texture became nicer. First, sun-dried zucchini and shimeji were sauteed in olive oil, and seasoned with sake and soy sauce. 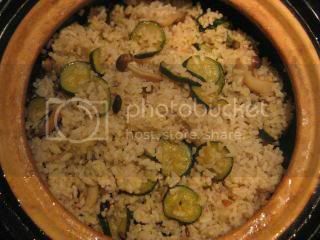 I made plain rice (with mixture of multi grains) with double-lid donabe rice cooker, "Kamado-san". 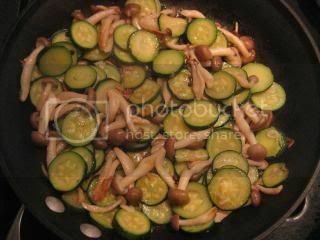 As soon as the rice was ready, I tossed the rice with the sautéed zucchini & mushrooms and some plum kombu tea powder. The addition of this plum kombu tea powder gives nice layers of umami flavors to the dish. Make sure to get a kind which doesn't have any MSG or artificial flavors. If you can't find plum kombu tea, regular kombu tea would work also. That's it! The sun-dried mushrooms give so much umami flavor that you don't need to cook the rice with any seasoning or stock before mixing with them. This rice dish has layers of flavors and you can also enjoy different textures of the ingredients. Really delicious. In “Kamado-san”, combine the rice and water, and cook according to the basic plain rice instructions. 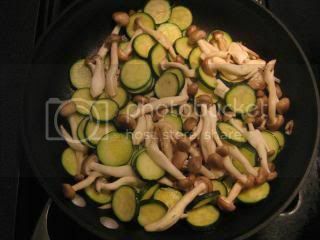 Meanwhile, in a sauté pan, sauté the zucchini and shimeji mushrooms in the olive oil (and butter if you like) for a couple of minutes over medium-heat. Add the soy sauce and cover. Cook until the sake is reduced down to almost nothing. Add the soy sauce and stir for a couple more minutes. Turn off the heat and set aside. 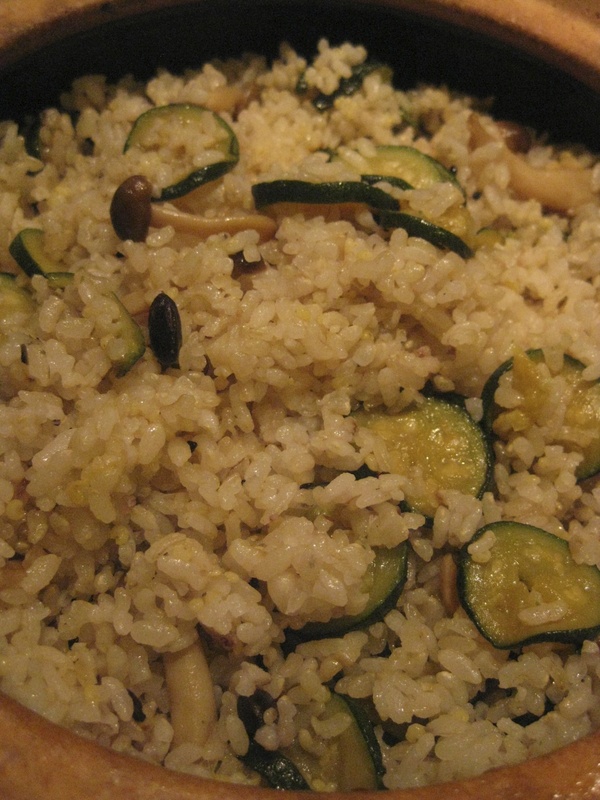 As soon as the rice is rested and ready, add the sautéed zucchini & shimeji, and plum kombu tea powder to the rice. Mix gently with a spatula. 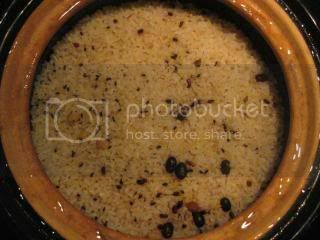 Serve into individual bowls and ground some black pepper over the rice. The other day, instead of shimeji mushrooms, I sun-dried enoki mushrooms to make this dish. It was so delicious, too.